Probate, or the court supervised process of settling and distributing a decedent's estate, is commenced in the county where the decedent maintained a primary residence at the time of his or her death. What happens, though, when a decedent owned real property in New Mexico outside their county of residence? For those situations, the estate's personal representative, (the fiduciary appointed by the court to administer the estate), is required to execute and file a statutory Notice of Administration under NMSA 1978, 45-1-404 in the county clerk's office where the property is situated. 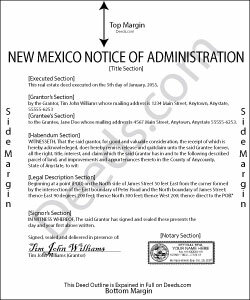 The notice states the name of the decedent, the title and docket number of the administration proceedings, a description of the type of administration, the court where the administration is commenced, the personal representative's name, title, and address, and a complete legal description of the real property. The personal representative signs the notice in the presence of a notary public before submitting it for recording. Once recorded in the conveyancing records where the property is located, no other documentation is required concerning the estate's administration in that county (45-1-404(B)). Along with meeting the statutory content requirements, the document should meet all state and county formatting standards for documents relating to real property. A copy of the notice may be filed in the probate records of the county where probate is opened, though this is not necessary. Consult an attorney with questions related to probate proceedings and Notices of Administration in New Mexico.